vestibular system | Apple pie, anyone? 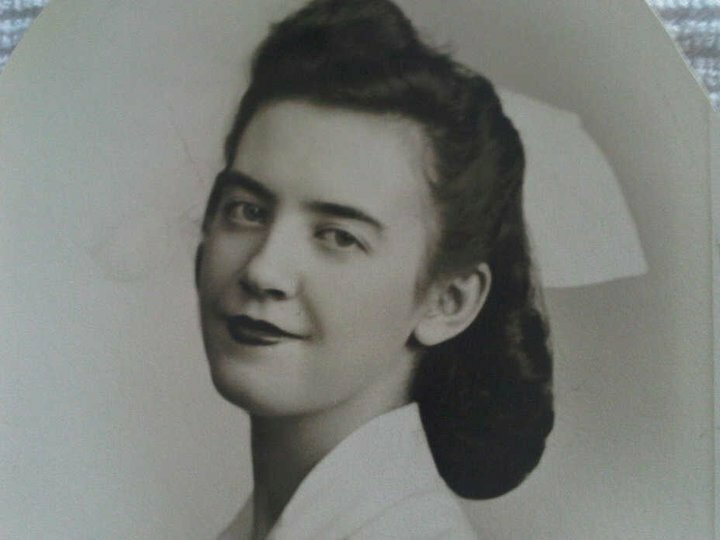 My grandmother (Sebeck), 1947, nursing graduation. We just don’t take portraits like we used to. This one has always taken my breath away. I hope you all had a lovely day Sunday. Ours was filled with sun and chocolate… and that’s about as perfect as it gets in my book. I solved a math problem for Curt. 1- It had been so effortless for me, and 2- I had beat him to the answer. It took us both a little while to get over it. I tell you this because it may prove to be one of the greatest moments in my life and I want you to celebrate with me. I, Katie Mulder, farm maiden and rec major, beat Curtis James, of spacial-awareness fame and engineering brain, to a correct and definitive answer. 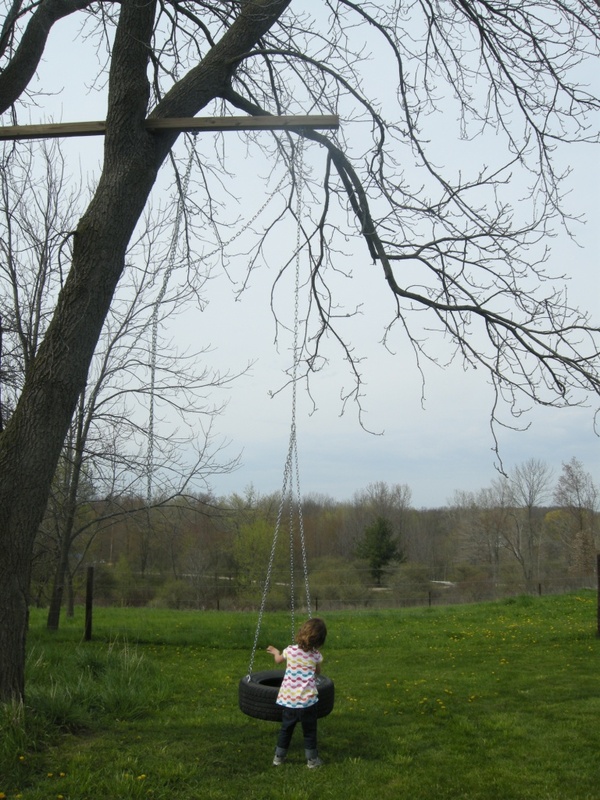 Ry loves to swing and I asked Curt if he would rig up a chain in the walnut tree. I believe his words were, “Sure. That’ll be easy.” A trip to the hardware store and 2 hours later, I walked outside to find my husband 30 feet up in the air with a chainsaw. After coming down, he explained that it was ‘perfect.’ And, it is. It is the most gi-normous, stable, scary, fantastic swing you will ever see in your life. This is where the math came in. The tire is suspended by 3 bolts and 3 lengths of chain. The tire had 45 groves going around the outside… thus, a bolt was needed at every 15 grooves. 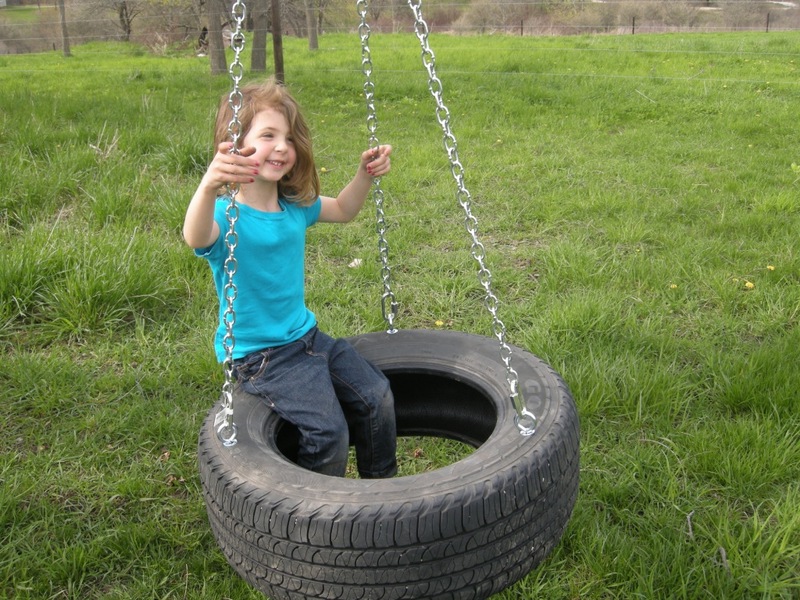 Used tires are free at any tire shop- they are happy to get rid of them instead of paying to fill the dump. This project also took 3 eye bolts, 3 nuts, 6 washers, 4 rapid links and some chain link… all easily found in any hardware store. Total cost = under $10. Rad. 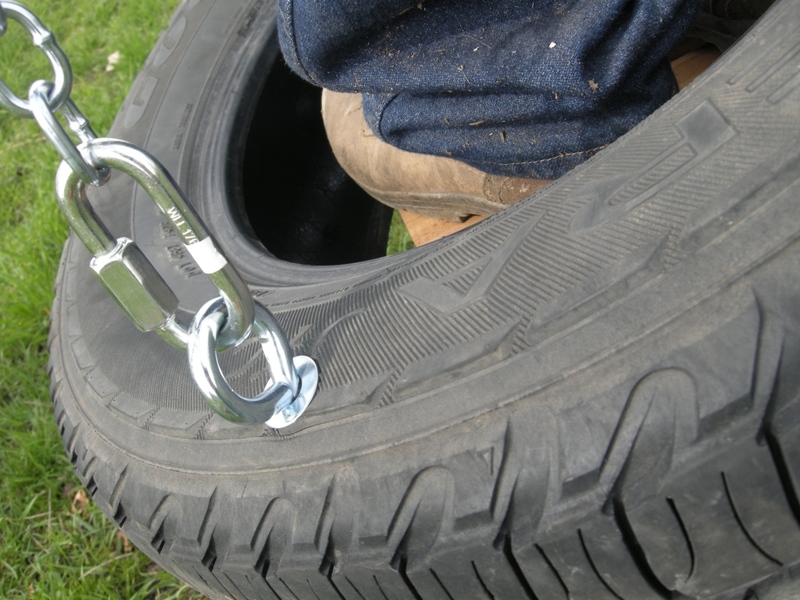 The tire is suspended by 3 lengths of chain all connecting at the top at one point. This allows the swing to spin in all directions. It makes me sick just thinking about it, honestly… too. much. spinning. For Rylie: it’s awesome. Her vestibular system craves this kind of movement and play. It will help her body make better decisions about balance and control itself. When the swinging/spinning gets to be too much, we can reverse the input effect by having Ry PUSH the tire or someone in the tire. This heavy work puts a cap on the processing and allows her body and brain to slow down and reorganize. Pretty awesome, I say, as long as I am not the one in the tire. 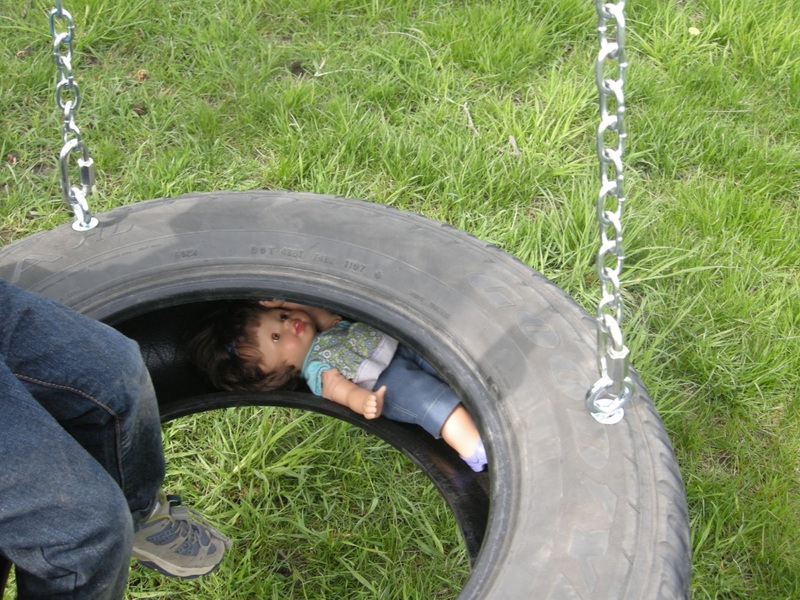 Plus, baby dolls have a very special place inside the tire wall. Ry is, in a word, thrilled. What was your worst subject in school? Curt and I both want to thank all of you who prayed for us last week during Rylie’s evaluations. We are so blessed to know people who love our kids and who sincerely want the best for them. This post is a (trust me) very brief synopsis of what the testing found. I am not an expert, by any means. Below is how I explain things in my head, though the examples and definitions may not be fit for the American Journal of Medicine. NOR are they appropriate for diagnosing your child. This is just a small window into the testing we experienced. I am unsure of where to start. Our trip to Detroit was hard. Let’s just do the facts today, ok? It will help me, hopefully, to be clear and get some of my notes down for later. The speech evaluation confirmed what we already knew: Ry has a classic case of Childhood Apraxia of Speech. Ry had 6 sessions of therapy with Nancy Kaufman. We now have an updated vocabulary list to work on, a few new speech exercises, and a better understand of what to tackle as parents vs. what to let her therapists handle. It was good to know that our current path is appropriate. Ry’s school therapist came down for the last day and was able to sit in on the final report. We are so blessed to have people so invested in Ry’s life. Nancy saw some things in her evaluation that were troublesome- namely, Ry’s impulsivity, constant movement, and lack of retention with directions. She recommended that we take advantage of the Sensory part of her clinic. We made an appointment for a 2 hour evaluation with the assistant head Occupational Therapist. Within 30 minutes, Magda had moved into an area of the body we were unfamiliar with… and an area that had never been tested on Ry: the inner ear’s Vestibular System. She failed every test. The system is a reflex and is thus unconscious in nature. We don’t realize we’re using it, but it’s necessary in nearly every single thing you do each day. Balance. Speech. Depth perception. Calming down. Processing information. Walking around objects. Controlling impulses. Our brain uses the 5 senses to process everything around us in time we cannot even measure, but it takes much longer for Rylie Girl. Everything for Rylie, most obviously her speech, is being translated. She looks at everything twice in order to make sense of it. We see a yellow sign with arches and we immediately think, “McDonalds.” Ry sees it and thinks, “Yellow sign. Arches. Food. McDonalds.” Ry sees a picture of a horse. She thinks, “horse” and then reminds herself how to make the sounds to verbally SAY ‘horse.’ Ry comes to a curb on the street. She stops and reminds herself ‘one foot up, another foot up.’ Everything must be practiced, memorized, and repeated until it becomes more like the reflex it ‘should’ be. No wonder my child is exhausted. Eating is hard. Walking is hard. Communicating is hard. And when her body has had enough, she cries. She cries hard and refuses to be consoled. Everyone does this to some degree when they’ve had enough. But for Rylie, this happens multiple times a day. Think of yourself as a puzzle all put together when you are rested, fed, and healthy. Now picture yourself throughout your day or week as little pieces of that puzzle start to pull away. You skip lunch one day. A friend is harsh with you. You get locked out of your car. Hundreds of times each day, we put ourselves back together. Ry can’t do that right now. Her body literally cannot do it. The system can be healed, but it will take time. We have to teach the left side of her brain to talk to the right side of her brain better. We have to work on her primitive reflexes (specifically her rooting reflex, tonic neck reflex, and derotational righting reflex) so her body can get stronger and let go of them. We have to give her body lots of heavy play activities to help it ‘organize’ itself when it comes undone. The ‘heavy work’ theory is really fascinating to me. It explains SO much about Ry. The goal of ‘heavy work/play’ is to make the body and senses stronger so that less extreme examples of input are necessary to process information. Because her Vestibular System is impaired, her senses are muted. This is why she she loves BIG stuff. Swinging… but swinging HUGE and for forever. Like, until my arms are going to fall off. Extremely loud music. Hopping incessantly when she’s upset. Riding on big, loud tractors. Kicking hard. Hitting harder. Spankings… she ASKS for spankings. All these extreme sensations are giving her body the information- the feeling- it craves. It organizes her. It puts her back together. Now the real work begins. There is every reason to believe Ry can live a completely normal life if we do some serious work between now and, say, age 6. Her speech, focus, anger, and retention will simply not improve in-depth until this vestibular system is better. It is great to have a focus. Exercises to do. Therapists to talk to. A children’s hospital and rehab hospital within 35 miles. It’s time to make a plan for both outside and inside this home before we lose any more ground. Hey! I'm so very glad you stopped by! This is where I process life with 3 children, 25 longhorn cattle, 5 chickens, one dog, a super cute husband, and a habit of losing my keys by untangling words and feelings into stories. Grace, peace, and much, much love to you today. Click here and I'll come straight to your email inbox. Best Friends Forever. In April 2013, I was blessed to share Ry's story with some of our community and thank the people who have loved on us thus far. Pssst... all content on TexasNorth.com is copyrighted [©]. Please do not reproduce any images or text without my permission. Thanks!